There are a few publications in Surgery which are legendary and masterworks, distillations of an entire career of a dedicated artist devoted to perfection in a limited sequence of operations in Plastic and Reconstructive Surgery. These two volumes represent such a masterwork, the work of Frederick Menick, who has spent his life developing, improving, teaching, and perfecting the craft of nasal reconstruction. In the procedures of nasal reconstruction are techniques essential to soft-tissue reconstruction anywhere in the face for us to learn and to improve our craft in the entire region. This book is a distant sequel to the first publication on the subject of G. Burget and F. Menick, Aesthetic Nasal Reconstruction, 1994, Mosby Year Book St. Louis, a book which revolutionized soft-tissue reconstruction of the nose. The book taught me and countless others good principles of soft-tissue management and replacement, to include the concepts of staged reconstructions, planning, aesthetic units, and the psychology of perception. Indeed, these techniques revolutionized how tissue was managed in facial reconstruction, taking the principles out of the era of unlike and mismatched soft tissue, to the remarkable results of modern facial reconstruction. Menick's second book “Nasal Reconstruction—Art and Practice” was published by Saunders/Elsevier in 2009, and grew to 760 pages, included a DVD ROM, and went a long way toward further refining and greatly amplifying the principles, developing techniques for the more challenging reconstructions, including refining, planning, philosophy, free tissue transfers, and how to integrate multiple types and layers of tissue in aesthetic reconstruction. This text brought us to the present era, and the publication of what is obviously his life's work, “Aesthetic Nasal Reconstruction, Principles and Practice,” 2017. Menick's current book is an anthology of nasal reconstruction techniques and perioperative problems, dealing with literally all of the issues that require consideration. It begins with a tribute to Millard, who taught both Burget and Menick basic principles of nasal and facial reconstruction, and then proceeds to chronicle the philosophy, steps, principles, and techniques into 33 chapters, beginning with philosophy, purpose, principles, and planning, to the specific issues of skin cover, lining, support (each of which are dealt with in multiple chapters) and finally to special topics. We begin by interviewing the patient, analyzing the defect, and then selecting the possible solutions for each of the tissue components of the nose. Plentiful good color photographs illustrate every technique described, with enough detail that the novice and experienced practitioner alike can each find and learn from the well-chosen examples. Many parts of this book should be studied by all those in training or in practice in plastic surgery, for it is in the exploration of the authors' philosophy and techniques that we mature and grow, taking the defect seriously enough to spend the time with the patient talking, planning, and refining the options to have mutually understood goals of specific management. 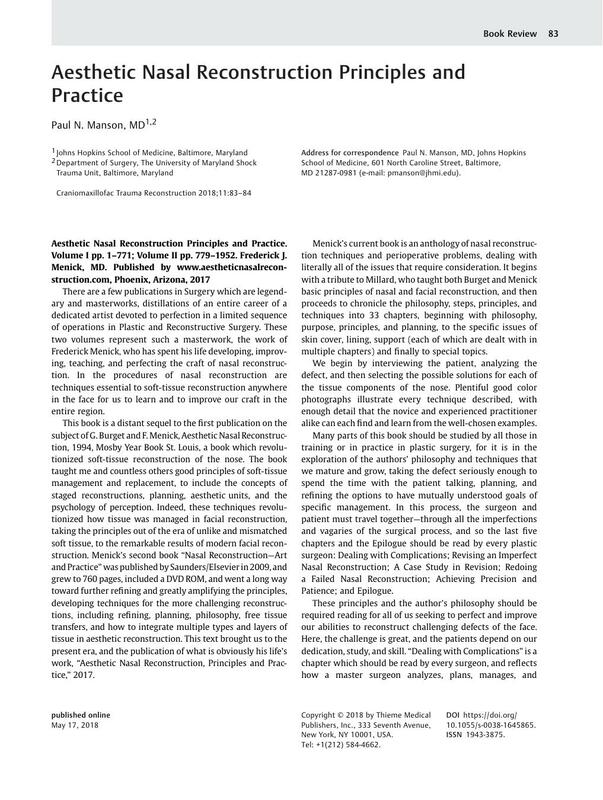 In this process, the surgeon and patient must travel together—through all the imperfections and vagaries of the surgical process, and so the last five chapters and the Epilogue should be read by every plastic surgeon: Dealing with Complications; Revising an Imperfect Nasal Reconstruction; A Case Study in Revision; Redoing a Failed Nasal Reconstruction; Achieving Precision and Patience; and Epilogue. These principles and the author's philosophy should be required reading for all of us seeking to perfect and improve our abilities to reconstruct challenging defects of the face. Here, the challenge is great, and the patients depend on our dedication, study, and skill. “Dealing with Complications” is a chapter which should be read by every surgeon, and reflects how a master surgeon analyzes, plans, manages, and improves a problem situation. Indeed, the basic issues and principles actually may apply to any type of surgery as principles of good analysis and management. I was especially disappointed to learn of the difficulty Dr. Menick had finding a publisher for this third book. Two of the publishers' comments who refused the book which Dr. Menick relayed to me were: “no one wants to read or buy a two-volume book” and “today, surgeons are only interested in a 10-minute video, watched immediately before the procedure.” I worked with Vesuvius Press in Phoenix, Arizona to design and print the book, but they felt they did not have the experience or ultimate interest in distributing the book. So, I purchased all rights to the book and am distributing it myself through the following website www.aestheticnasalreconstruction.com. Fortunately, the two-volume text is out, and represents an essential purchase for those of us who wish to improve our craft by studying these lessons from the world master. Thanks to the tireless work and teaching provided, we will become better at managing this ancient art of nasal reconstruction.